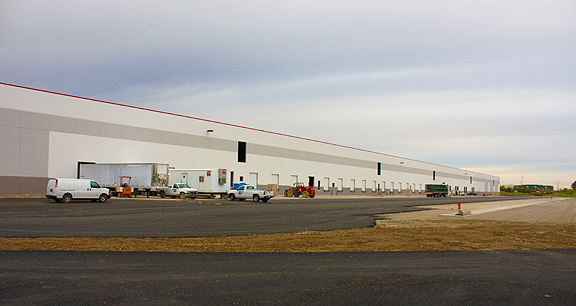 Project obstacles and solutions: In Febraury 2014, Dunham's Sports announced it would build a new 735,000 square foot distribution facility in Marion, Indiana. GDI was chosen as the general contractor. Trace Construction poured all of the concrete on the project, including the foundation floor. E&B Paving provided all driveway and parking lot paving. The construction schedule was very tight on this project. It is scheduled to open late fall in 2014. Spring and summer rains delayed early work. IMI Aggregates provided 50,000 tons of crushed stone for the subsurface base inside and outside the building, plus blended aggregates for the concrete and asphalt on the project. They also provided aggregates for backfill and erosion control, delivering stone and sand for GDI, E&B Paving, Trace Construction, plus two electricians and one plumbing company - all at the same time. IMI Aggregates adjusted stockpiles at three different quarries to meet the demands of the project. The concrete mix for the warehouse floor was designed so that no reinforcing steel would be necessary. It used blended coarse aggregates to tackle two problems that can occur with large slabs on grade. Large stone was used to increase structural strength in lieu of steel reinforcement. A smaller stone was blended to reduce curling and to control shrinkage. IMI supplied 18,000 yards of concrete for this project, which included the foundation floor, the pavement for 65 semi docks, dolly pads in the parking lot for trailer parking, and a mezzanine.